Making inferences is a very important skill for readers to comprehend stories and other texts. To make inferences, readers combine clues from the text with their own background knowledge to figure something out about the story. It is basically like a math equation. 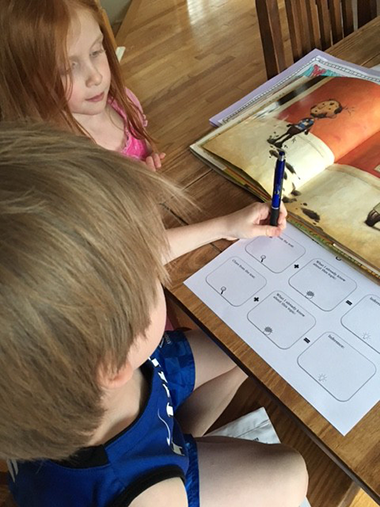 You add text clues to what a reader already knows and those should combine to help the reader understand the story. The Making Inferences graphic organizer on the IRRC website is a great tool to use to help children organize their thoughts and make inferences. I printed a couple copies of the Making Inferences graphic organizer to use with my own children during our daily read alouds. My children liked using the Asking Questions for Lower Grades organizer last week, so I knew they would be eager to use this new tool. Me: How do you guys think I am feeling? Me: Did I tell you I was mad? Did I use that word? How did you know? Ryan: No, you acted mad. Ryan: You stomped on the floor and slammed the door. Me: How do you know that means I am feeling mad? Griffin: Because, I have seen people stomp when they’re mad. Sully does that. And, sometimes when people are mad they might feel like slamming a door. Next, I explained to my children that they can use this skill of making inferences in their own reading. I told them that authors rely on them, as readers, to infer some details from a story because it makes the text more interesting. I told Griffin and Ryan that readers can use pictures and the text to help them make inferences. We started with a book we have read many times. No, David is a book where the reader must rely on pictures to infer why David is getting in trouble and why his parents might be upset. To practice using the organizer, I stopped a few pages into the book and asked them some questions about clues they see and what they know. Me: What is going on here? Me: Great, let’s jot that down on our organizer. Do you know anything about writing on walls with crayons or markers? Griffin: I know one time Ryan drew on the walls in our old house, and you got upset because it is hard to get off. Me: Let’s jot your thoughts down under what you already know. Now, if you put those two things together, what inference can you make? Griffin: David is going to get in trouble because his mom is yelling at him, and he is doing something that is bad. Me: Great. You just made an inference. How easy was that? Now, how do you know it is his mom, and not his dad, yelling? We stopped a few more times, and they combined the clues from the author with their own knowledge to make some inferences. I had them fill in part of the organizer, and they enjoyed getting to do part of it themselves. The next day, we resumed reading our chapter book, My Father’s Dragon. I explained that although this book has some pictures, we would be using the words, or text, to make inferences. I printed another copy of the Making Inferences organizer to use for our practice. In some parts of the story, I had to point out a clue and, then, prompt the children to think about what they already knew about it. I think learning to make inferences is something they will have to keep practicing until they learn to do it automatically while reading. Making inferences can be a challenging skill for readers to develop, despite being a skill people apply in other situations of everyday life. So, I know I will need to focus on making inferences more than once or twice. The Making Inferences organizer provides an easy way for me to help the children organize information and then add it all up. Picture books, including wordless books, are a great place to start, but that is not always necessary. The Making Inferences organizer was an easy way for me to explain such an important skill and help my children practice it while reading.